Probiotics in Animal feed Market deals with production of probiotics, the forms of probiotics available and the dosage of feeding, effects of digestion in the animal. 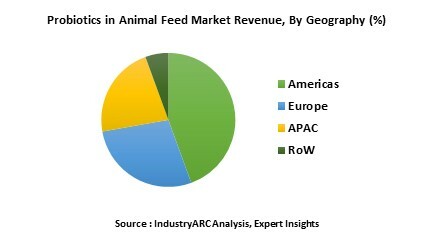 The Probiotics in animal feed market is expected to grow at a CAGR of 8% during the forecast period i.e. 2018 to 2023. The Probiotics are generally fed in the animal food to gain immune system by killing pathogens that harms the body. Asia-Pacific is the largest regional market accounting for a global probiotic market and North American countries are becoming major markets in probiotics by creating awareness to the customers to use more probiotics in future. What is Probiotics in Animal feed? Probiotics are the good micro-organisms such as bacteria and fungi requires for the growth of animal immune system. The feed additives supplied through food to the animals is called as Probiotics in Animal feed. The probiotics are of both Bacterial and Non Bacterial type. The examples of Bacterial Probiotics are Bifidobacterium, Lactobacillus, Pediococcus, Streptococcus, etc. The Non-Bacterial probiotics are fungus and yeast like Aspergillus oryzae, Candida Pintolopessi etc. Instead of producing Antibiotics that cause side effects to the animals, the companies are promoting Probiotics these days. This process widely used for Swine feeding and poultry feeding. Lellemand probiotic product received Organic Certification from Australian Certified Organization (ACO). Probiotic and yeast derivatives are recognized as scientifically-proven alternatives to antibiotics in all production systems and are now widely used in Australia, USA and Europe. Who are the Major Players in Probiotics in Animal feed Market? The companies that involved in the market of Probiotics are Lallemand, BNA, Provita, DVS bio life ltd, Sweet pro, chr. Hansen, Evonik, Prowell, etc. 14.10. Specialty Enzymes & Biotechnologies Co.